samsung galaxy note 8 64gb maple gold.In absolutely immaculate condition,its hardly been used.Comes with all accessories including unused headphones.Genuine Australian with no carrier branding fully unlocked.Already updated to the latest version of android and ready to go.Also comes with a new Tech 21 case that was $50. Samsung Galaxy Note8 Unlocked Unwanted Gift. Sent with Australia Post Pre-Paid Parcel Post Satchel 500g. RECEIVE 7% DISCOUNT, USE CODE PRESS AT CHECKOUT. 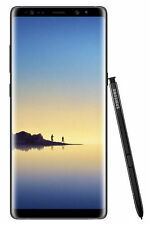 Samsung Galaxy Note 8 SM-N950F 64GB - Midnight Black. In EXCELLENT condition. 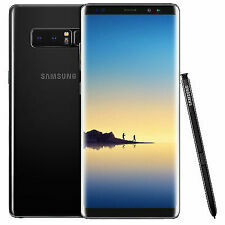 Samsung Galaxy Note8 SM-N950 - 64GB - Midnight Black Smartphone. The condition is used but this phone has been taken care very well. The back glass pristine but is covered with Slickwraps but can be removed on request. It has always been in its case in addition to this. Included in this sale is 2 Note 8 cases: Samsung Rugged and Zizo Bolt case. This phone be sent with Australia Post Pre-Paid Parcel Post Satchel 500g. 4.5 out of 5 stars - Samsung Galaxy Note 8 SM-N950F 64GB - Midnight Black. In EXCELLENT condition. 17 product ratings17 product ratings - Samsung Galaxy Note 8 SM-N950F 64GB - Midnight Black. In EXCELLENT condition. 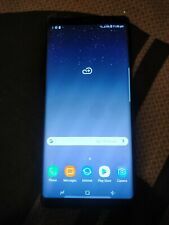 Samsung Galaxy Note8 - 64GB - Black NO RESERVE! FOR SALE IS A BLACK SAMSUNG GALAXY NOTE8 64GB NO RESERVE! Up for sale this SAMSUNG GALAXY NOTE 8. Great buy for person who intends to replace front screen and digitiser! Trending at AU $577.99eBay determines this price through a machine-learned model of the product's sale prices within the last 90 days. SAMSUNG GALAXY NOTE 8 DUAL SIM. If you have not receive your item after max. If item listed as faulty ?. parts missing ?. Samsung galaxy note 8 in poor conditon has cracks in glass, and the ear speaker is not working. phone works on loud speaker the screen all works if you use the stylus selling cheap would be a fantastic phone if someone knows how to repair Samsung Galaxy Note8 SM-N950 - 64GB - Maple Gold Smartphone. Condition is Used. Sent with Australia Post Pre-Paid Parcel Post Satchel 500g. Otherwise the phone might not receive signal. The phone has no problems and scratches. SAMSUNG GALAXY NOTE 8 - 64GB. WARRANTY INFORMATION Warranty is an important issue to consider when buying electronic products, especially when purchasing online. What is not covered by my Limited Warranty?. Defects are often causéd by viruses from unauthorised access to services, other accounts, computer systems or networks. Great = Minimal signs of wear. CASH ON LOCAL PICKUP. Product Condition. Samsung Galaxy Note8 SM-N950 - 64GB - Midnight Black Smartphone - BRAND NEW. Condition is Brand New, sealed in original box. This was a replacement phone from insurance after losing my previous one. Just received it from Australian insurance provider. The item will be wrapped very carefully to avoid date during postage and sent within 1 business day of payment. Thanks so much! Brilliant condition Galaxy Note 8, 64gb Maple Gold Just had screen replaced at Samsung Store in Sydney (invoice provided) and they replaced the battery also. So it's basically a new device. Selling as I just got a work phone. This phone just got updated to Android Pie 9.0 as well. Comes with original box. Phone will be Express Posted with tracking. Upgrade to a Note 8 today. SIM Dual SIM (Nano-SIM, dual stand-by). 2G bands GSM 850 / 900 / 1800 / 1900 - SIM 1 & SIM 2 (dual-SIM model only). Internal 64 GB, 4 GB RAM. Battery Non-removable Li-Ion 3000 mAh battery. Item must keep original condition without any accessory, case, protections used or missing parts. Samsumg GalaxyÂ Note 8 Dual Sim N950 64GB Smart Phone. 6GB RAM / 64GB ROM. Speakerphone Yes. SIM Card Type Hybrid Dual SIM (Nano-SIM, dual stand-by). Samsung Galaxy Note 8. Get crisp photos even when it's dark and it's difficult to keep your phone steady. 6GB RAM / 64GB ROM. Plus, with wireless charging, power is on your side. Samsung Galaxy Note 8 (SM-N950F/DS). Get crisp photos even when it's dark and it's difficult to keep your phone steady. See the bigger picture and communicate in a whole new way. 2G bands:GSM 850 / 900 / 1800 / 1900 - SIM 1 & SIM 2. 4G bands:LTE. Technology:GSM / HSPA / LTE. The Galaxy Note8 is your portal to a new world when connected to this range of devices and interfaces. 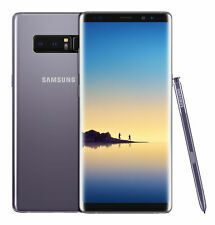 1 x Samsung Galaxy Note8 Dual SIM 4G LTE SM-N9500 64GB Orchid Grey. SAMSUNG GALAXY NOTE8 Dual SIM 64GB 4G N950F/DS Maple Gold WARRANTY Unlocked. / 16GB Driving Kit / SAMSUNG GALAXY NOTE8 Dual SIM 64GB 4G N9500 Orchid GREY. The Note8 lets you take your digital life with you. 64GB of built-in storage is backed by a microSD card slot that lets you add another 256GB at will so you always have room. But that’s not all. The pressure-sensitive S Pen turns your Note8 into your dream notebook. 1 x Samsung Galaxy Note8 Dual SIM 4G LTE SM-N950F/DS 64GB Orchid Grey. SAMSUNG GALAXY NOTE8 Dual SIM 64GB 4G N950F/DS BLACK WARRANTY Unlocked Phone. SAMSUNG GALAXY NOTE8 Dual SIM 64GB 4G N9500 BLACK WARRANTY Unlocked Phone. Samsung Galaxy Note8 Dual SIM 4G LTE SM-N950F/DS 64GB Midnight Black 1 x Samsung Galaxy Note8 Dual SIM 4G LTE SM-N950F/DS 64GB Midnight Black. Samsung Galaxy Note8 Dual SIM 4G LTE SM-N950F/DS 64GB Midnight Black. Hardly used. Sitting at home most of the time. In brand new condition. Comes with all original accessories and extra 32gb external sd card. Paid $1400.00 for it. Grab this bargain. The phone is super fast and feel very premium. Amazing camera and heart monitor etc.. selling due to receiving another phone as gift. Samsung Galaxy Note8 Dual SIM 4G LTE SM-N9500 64GB Midnight Black 1 x Samsung Galaxy Note8 Dual SIM 4G LTE SM-N9500 64GB Midnight Black. 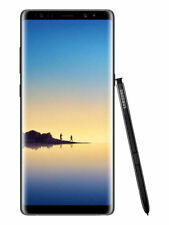 Samsung Galaxy Note8 Dual SIM 4G LTE SM-N9500 64GB Midnight Black. Samsung Galaxy Note8 SM-N950 - 64GB - Midnight Black Smartphone. New in box. Free genuine Samsung Flip Wallet Case (Brand New) worth $89.00 Free spare Incipio brand phone cover (Brand New) worth $99.00 Free Memory card (Brand New) worth $34.00 Free high quality screen protector (Brand New) worth $99.00 All genuine Samsung accessories in box and unused. No scratched or marks. Box opened only to update Android operating system to Android Pie. Sent with Australia Post Pre-Paid Parcel Post Satchel 500g. SAMSUNG GALAXY NOTE 8 64GB PHONE. AUSTRALIAN STOCK. NEW AND SEALED! LAST ONE!. SAMSUNG GALAXY NOTE 8 64GB PHONE. Large 64gb storage built in with micro sd slot for expandable storage up to 256gb. Wireless charging capabilities for the ultimate convenience. NEW AND SEALED! IP68 Water and Dust resistant - take it anywhere. 4.5 out of 5 stars - SAMSUNG GALAXY NOTE 8 64GB PHONE. AUSTRALIAN STOCK. NEW AND SEALED! LAST ONE!. 17 product ratings17 product ratings - SAMSUNG GALAXY NOTE 8 64GB PHONE. AUSTRALIAN STOCK. NEW AND SEALED! LAST ONE!.